5793 labyrinths found. Showing 161-180. Sorted by country, state, city, then zip/postal code. Just outside the Canberra ACT border. Turn off the Barton Highway near Hall Village into Wallaroo Road, then right into Oakey Creek Road. 15 minutes from Belconnen; 20 minutes from Civic. From Warragul-Korumburra Road roundabout travel 1.7km towards Korumburra, turn left into East West Rd. 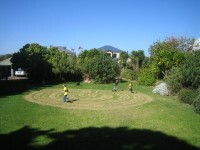 grass clipped classical cretan labyrinth..my kids love it! Calll for scheduled events, also available for hire - indoor or outdoor. Labyrinth is located in the grounds on the northern side of the hospital, in the children's garden at the northern end of the central pathway, via Level 1 (lower ground) doorway from hospital building. Park in paid Visitors' Carpark (entrance via roundabout, cnr Hawkesbury Rd & Hainsworth Street) or where permitted in adjacent streets outside hospital. The labyrinth is in the Gallery of Gardens at the National Arboretum Canberra. It is located six km from the centre of Canberra, at the western end of Lake Burley Griffin. The National Arboretum is open from 6am-8.30pm seven days a week. Entry is free of charge however pay parking applies from 9am-4pm. -35.287797 ° Lat. ; 149.069324° Long. My first walk on the Labyrinth. (October 5, 2008) Corrimal Comunity Centre. One hour west of Sydney, a left turn off the Great Western Highway at Woodford, head down the driveway to the bottom, please call or email ahead for directions. If you take the bridge over Danube river to Emmersdorf, the labyrinth is located 100 meters up the hill in a meadow. Signs show the way. 47°03'06,38" N° Lat. ; 15°25'52,40" O° Long. About 50km North of Salzburg; near the village of Reichsdorf next to the Mattigtal Cycle Route R24. 48 deg. 29' 10.° Lat. ; 13 deg. 48' 36.° Long. 48 deg. 28' 38.° Lat. ; 13 deg. 50' 0.5° Long. +48 28' 4.67"° Lat. ; +13 49' 13.99"° Long. 20 minute walk from railway station, 15 minute walk from old city. The labyrinth existed from 2004 to 2013, but has now been removed. The website provides witness of this amazing labyrinth. 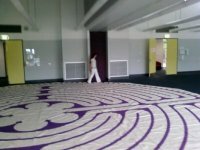 At the moment (June 2011) we have 88 labyrinths in Austria in public spaces - visit the website above for details!